Once in a while, researchers engaged in an archival project will catch themselves daydreaming about that elusive, perfect document. Like fishermen, who can lose track of time and everything else while imagining themselves landing that marlin, or like archaeologists who fantasize about uncovering that one rosetta-stone-like artifact that will suddenly make intelligible and whole all the other shards of evidence they have collected, historical researchers also indulge in all kinds of wishful thinking. Our dream document would come from a period close enough to the arrival of the cigar industry to Tampa (1886) so that it would contain first-hand “living” memory of that momentous event, but from a period far away enough from that foundational moment so that it would reflect –and reflect upon– the dizzying development that rapidly ensued. Our made-to-order primary source would be dated, let’s say, about a quarter of a century after the arrival to Tampa of Martínez Ybor, Haya and company. Who says dreams don’t come true? Thanks to a post by Dan Pérez on a West Tampa Facebook Page, we were led to a truly astounding document that can viewed and downloaded here. 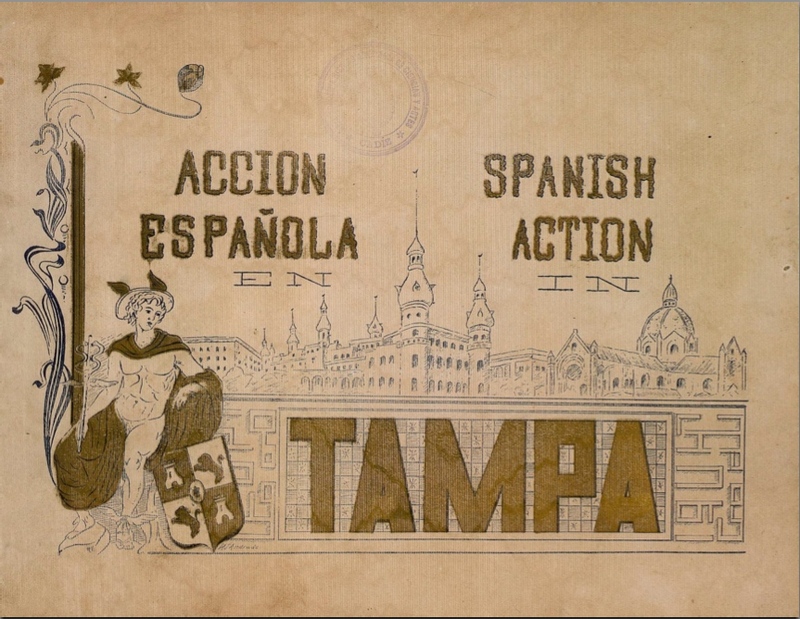 Acción Española en Tampa/ Spanish Action in Tampa is a truly extraordinary snapshot of Spanish Tampa taken in 1913 and it features all those characteristics we’ve dreamt about. The document has been preserved digitally and made public thanks to a collaborative effort between the Real Academia Hispano Americana de Ciencias, Artes y Letras and the Joseph P. Healey Library at the University of Massachusetts, Boston. Enjoy! And please leave comments below. We want to make sure that the document can be easily downloaded, and we’d love to hear what you think about this treasure. 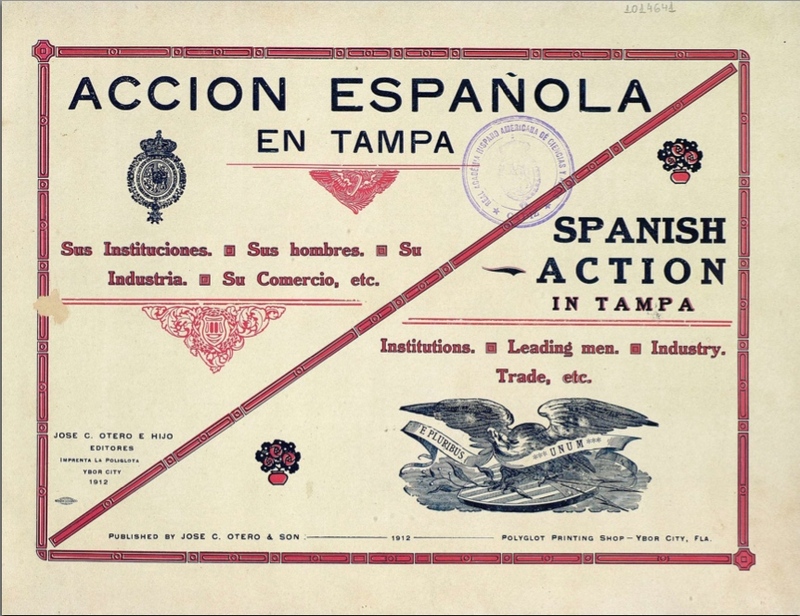 This entry was posted in Florida and tagged Acción Española, Florida, Spanish Action, Tampa. Bookmark the permalink. This was riveting to me. Despite being in the middle of a heavy editing project for my book, I opened the posting and read every page! I was glad to see some of my ancestor’s names although probably not related, Alonso, Rey, Corral, Garcia… I liked reading about the Cuesto Rey and Company, THE TRULY SPANISH HOUSE. I enjoyed seeing the man in uniform showing Knights of the Holy Sepulcre. And Naturopathic Science, a Vegetarian Restaurant in 1907?? Dr. Arguelles’s Sanatorium was a springboard all those years ago?? As a writer, I was very impressed with a line, “The new plan was debated with all the hot eloquence of proverbial occurrence in Spanish meetings…..” THANK YOU for posting this! I was especially impressed by the rare photos of some of the founders, owners and officers of the mutual aid societies and businesses. I had never heard of some of those societies. Wow! Fantastic introduction! Thanks so much for giving this publication the exposure it deserves.